With less than one month to go prior to Melbourne, we’re now left with only two launches remaining, as the first incarnation of Force India’s 2009 challenger, the VJM02 broke cover and made its maiden debut at Silverstone, for shakedown testing on February 25th prior to this week’s testing at the overly damp Jerez circuit, with seven rival teams on hand. The VJM02 is what can only be seen as a customer derivative of the McLaren team’s chassis, as they’re providing Mr. Malia’s squad with engine, drivetrain and KERS, along with Force India now being overseen by new Chief Operating Officer Simon Roberts, Whom was previously employed by McLaren. 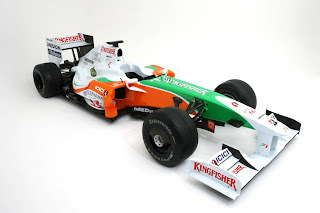 The VJM02 will run in a mix of Indian colours, predominantly orange, green and white and one of F1’s elder statesmen, Giancarlo Fisichella said he was pleasantly surprised with the chassis after 50 trouble free laps in his first outing in the new race car. Hmm? Does this imply that the VJM01 was a “Dog” of a racecar last season?